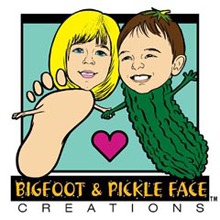 Bigfoot & Pickle Face™ Creations is excited to present clear rubber stamp kits and stamping accessories that are designed for kids and the kid at heart. The kits contain a clear stamp set, acrylic blocks and childsafe/washable dye ink pad; all that is needed is the paper. The fun designs encourage children to use their creativity and imagination by stamping out a story with our images, creating homemade cards for family or for use with their scrapbooking project! Our fun designs are kid tested and kid approved. We provide clear rubber stamp sets to compliment the kits, along with additional childsafe/washable ink pads. Clear rubber stamp kits come in three themes: "Fun with Fish", "Circus Act" and "Farm Friends." The clear rubber stamp kits are priced just right for birthday and holiday gifts or just a great interactive and creative item to buy for your own kids crafts. We are proud to say that our products are made and assembled in the USA.